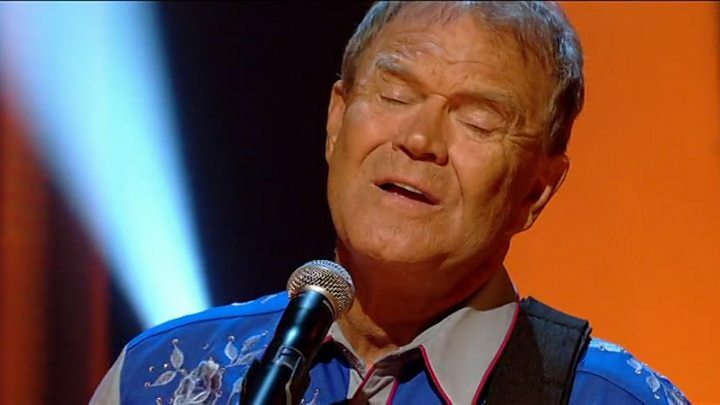 Media captionGlen Campbell performs Wichita Lineman on Later... With Jools Holland in 2008. A simple tale of a lonely telephone repairman working in the vast open plains of the American Midwest, Wichita Lineman is one of the most perfectly realised pop songs of all time. 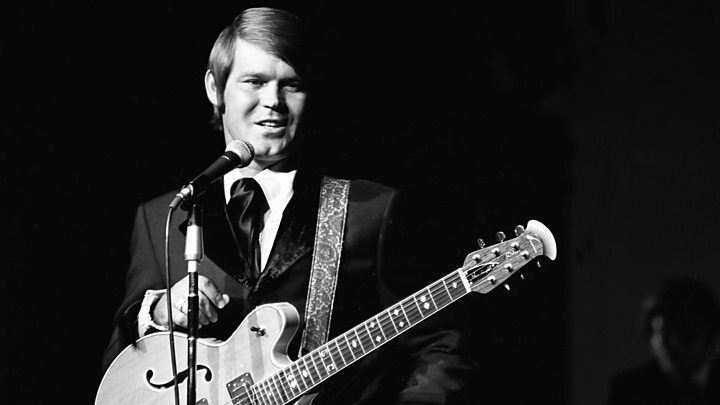 Released in 1968, and written by Jimmy Webb, it was the first top 10 single for country singer Glen Campbell, who died on Monday, aged 81. Like many of his fans, Campbell's reaction to the song was immediate and tender. "When I heard it I cried," he told BBC Radio 4 in 2011. "It made me cry because I was homesick." The lyrics describe a lineman who is also pining for home and imagines he can hear his absent lover "singing in the wire". "I need you more than want you, and I want you for all time," he tells her. "And the Wichita Lineman, is still on the line." Webb, while proud of the song, has always insisted it was unfinished, and says he initially considered that famous couplet "the biggest, awfulest, dumbest, most obvious false rhyme in history". He wrote the song to order in 1968, after Campbell had found success with another of his songs, By the Time I Get to Phoenix. "They called me and said, 'Can you write us a song about a town?'" he recalled in a Radio 2 documentary about Campbell's career. "And I said, 'I'm not sure I want to write a song about a town right now. I think I've overdone that'. "He said, 'well, can you do something geographical?' and I spent the rest of the afternoon sweating over Wichita Lineman." Although the song is set on the Kansas-Oklahoma border, Webb actually wrote it at a grand piano in Hollywood. "I was living in a kind of communal environment with 25 or 30 of my best friends," he said in the book Chicken Soup for the Soul: Country Music. "There were a couple of clowns who came into my music room and spray-painted my piano green, I think, because of [the lyrics to] MacArthur Park: 'All the sweet, green icing flowing down.' They thought it was pretty funny. "So I spent the afternoon trying not to brush up against the piano and writing a song at the same time. That whole afternoon was a comedy, with a sticky green piano and several desperate calls from the recording studio." He had called up the image of a lineman from a childhood journey across the panhandle of Oklahoma. "There's a place where the terrain absolutely flattens out," he told the BBC. "It's almost like you could take a [spirit] level out of your tool kit and put in on the highway, and that bubble would just sit right there on dead centre. It goes on that way for about 50 miles. "In the heat of summer, with the heat rising off the road, the telephone poles gradually materialise out of this far, distant perspective and rush towards you. "And then, as it happened, I suddenly looked up at one of these telephone poles and there was a man on top, talking on a telephone. "He was gone very quickly, and I had another 25 miles of solitude to meditate on this apparition. It was a splendidly vivid, cinematic image that I lifted out of my deep memory while I was writing this song." "I thought, I wonder if I can write something about that? A blue collar, everyman guy we all see everywhere - working on the railroad or working on the telephone wires or digging holes in the street. "I just tried to take an ordinary guy and open him up and say, 'Look there's this great soul, and there's this great aching, and this great loneliness inside this person and we're all like that. We all have this capacity for these huge feelings'." But while Webb worked on the lyrics, Campbell and his producer Al DeLory were getting impatient. They were in the recording studio, with a tight deadline, and no song to record. "They said, 'We're really in a hurry, send it over'. And I said, 'OK, but the third verse I don't have'." What Webb didn't know was that DeLory's uncle had been a lineman in Kern County, California. "As soon as I heard that opening line," he later recalled, "I could visualise my uncle up a pole in the middle of nowhere. I loved the song right away." "He wrote it for me in no time," Campbell agreed. "Jimmy Webb is just that kind of a writer. He's such a gifted man." Campbell cut the song with musicians from The Wrecking Crew - a group of LA session musicians who played on most of Phil Spector's records, as well as the first Monkees' albums and The Byrds' cover of Bob Dylan's Mr Tambourine Man. 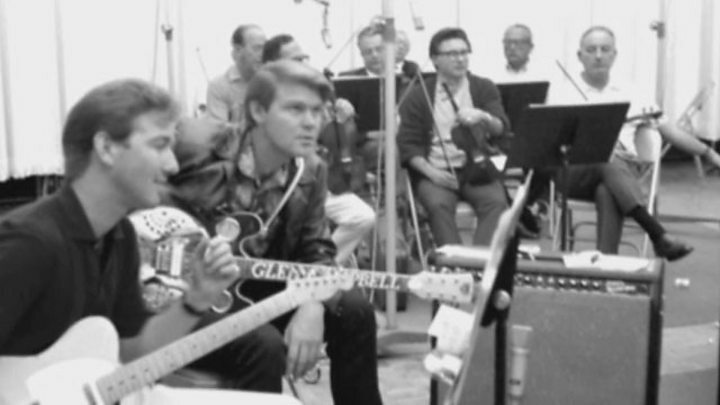 Media captionJimmy Webb and Carol Kaye reveal how Wichita Lineman came to life. "We knew that this tune was special," said bassist Carol Kaye - who added the descending six-note intro. "When he started singing, the hair stood up on my arms and I went, 'Woah, this is deep'." Musically, the song plays a clever trick by starting in the key of F major before switching to the relative minor, D major and never fully resolving - echoing the lineman's disjointed state of mind. DeLory wrote an evocative orchestral arrangement in which the strings mimicked the sighing of the telephone wires. To get around the problem of the unfinished third verse, Campbell picked up Kaye's DanElectro six-string bass guitar and improvised the song's famous solo. Webb, however, thought they'd rejected the song. "A couple of weeks later I ran into him [Glen Campbell] somewhere, and I said, 'I guess you guys didn't like the song.'" he recalled. "He said, 'Oh, we cut that'. I said, 'It wasn't done! I was just humming the last bit!'" "He said, 'Well it's done now!'" Wichita Lineman jump-started Campbell's career, helping the album of the same name go double platinum in the US, and giving the star his first chart hit in the UK. But over the years, Campbell was always careful to highlight Webb's role. "He's just an exceptional writer. He pours his heart out," he said. "And I think that's where the music comes from: the heart." Webb returned the compliment, telling BBC Four: "He made me sound good. He made me sound like a genius. But really, I just did what I did and he had the wherewithal to follow through - and hit some notes that really, honestly, he shouldn't have been able to hit. "A lot of other singers would have said, 'Hey, listen - take this home and work on this, son. Because I can't sing on that.'" And what about that "dumb" lyric? Over the years, Webb made his peace with the line - realising his discomfort over the rhyme had blinded him to the words' raw power. "Had I known what I was doing, I wouldn't have written that line. I would have found a way to make it rhyme," he told NPR in 2010. "It was only years later that I became aware of what a songwriter was even supposed to do. I was really just a kid who was kind of writing from the hip and the heart." David Crary, a real-life lineman who repairs high voltage power lines across America, says he wouldn't change the words for the world. "I think Jimmy Webb hit the nail on the head," he told Radio 4. "It describes a lot of linemen, what they go through on the road, away from their family. "When I hear that song, or when I'm singing it, it brings lots of memories back of storms that I've been on, whether they're ice storms, hurricanes [or] tornadoes. "The most important part is getting back to your family in one piece." Campbell - who spent the majority of his life on the road - had an equally personal connection to the lyric. "'I want you for all time,' I always say that to my wife, because it cheers her up," he said. "We got some grown kids and they say, 'Oh, you guys. You guys are like lovebirds.'"